Even though the 2016 World Series gets underway tonight, you might not be in the mood to watch it. Want to look back on some better days instead? Here, and all available on YouTube, are some alternatives that will make for more pleasant viewing. The videos are the complete games, so watching these should keep you busy … and able to avoid whatever might be happening in this year’s World Series. Starting off with an absolute classic in a year that didn’t result in a Cardinals World Series championship, but began with an incredible performance by that year’s NL Cy Young Winner and Most Valuable Player, Bob Gibson. His 17 strikeouts in the game are a record that still stands. Ah, nothing like a Game Seven — especially when it’s a Game Seven win! Watch the Cardinals win their ninth World Series championship, and first since the days of Bob Gibson in 1967, when they beat the Brewers 6-3 behind Joaquin Andujar and Bruce Sutter. Yes, it’s fun to look back five years ago into the AMF archives and see how we captured the magic of September and October 2011 during the blog’s first year. In fact, had that run not happened, I was planning to write about the fifth anniversary of the Cardinals 2006 World Series run. Still, tonight is the anniversary of another milestone in recent Cardinals history: the 10th anniversary of Game Seven of the NLCS between the Cardinals and the Mets. And, to honor that milestone, the three iconic plays from a truly incredible game. From the sixth inning, with the scored tied 1-1. Ten years later, it doesn’t get old. 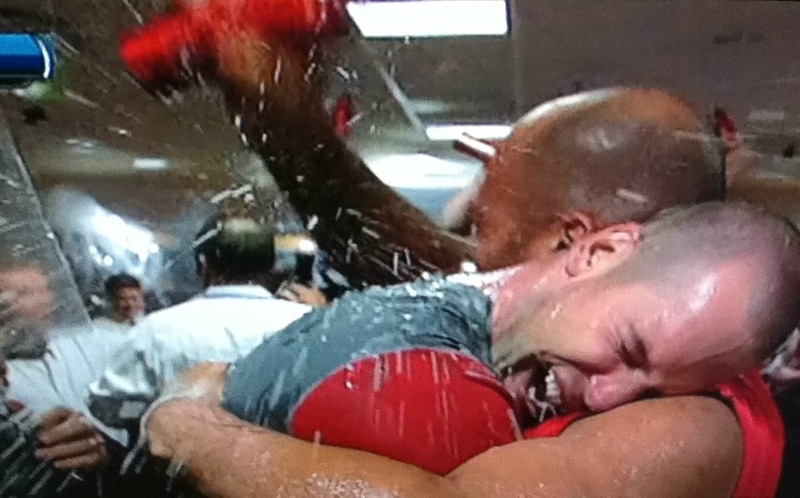 Five Years Ago Tonight: That’s An NL Pennant Winner! You might be looking for some positive baseball news these days, so how about a trip back to the evening of Sunday, Oct. 16, 2011? That’s when the St. Louis Cardinals won their 18th National League pennant by beating the Milwaukee Brewers in those games that filled the time between the classic National League Division Series and even more classic World Series. I honestly don’t remember much about the 2011 NLCS, other than the October Legend of David Freese had its first chapters, as he was named series MVP, and all of the relievers got a lot of use, and also deserved to be named series MVP. And maybe that’s fine. Scrolling back through the posts from the series and seeing names like Prince Fielder and Ryan Braun and Nyjer Morgan — ugh. So much better to remember the Rally Squirrel instead. And, of course, a pennant-clinching win. Especially because we remember what happened in the days to follow. Believe It! Cardinals Are In The World Series! We’re always told to never give up, always keep trying, you never know how things will work out. If you ever question whether that’s true or not, you now have the perfect example of what not giving up can get you. 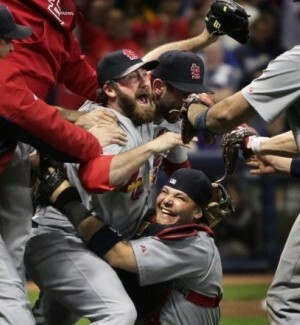 It bears repeating again and again — the 2011 St. Louis Cardinals are National League champions! Next happy flight: home to host the Texas Rangers in game one of the World Series on Wednesday! It’s the Cardinals’ 18th NL pennant, and their third trip to the World Series since 2004. They’ll be going for their 11th World Series title — #11in11 as those of us on Twitter have seen so often — and will take on a Rangers team that’s making their second (and second consecutive) trip to the Series. And while it’s been quite a ride since Aug. 25, last night was perhaps the wildest of them all. With the memories of the Cardinals miraculous run to the 2011 World Series championship five years behind us, the biggest moments are what stand out the most. And five years ago tonight was a defining one: Game Five of the division series against the Phillies, Chris Carpenter vs. Roy Halladay. The Friday night battle to determine who would move on and face the Brewers (oh yeah, they were in the playoffs that year too) lived up to the hype — which, as we know, doesn’t always happen in baseball. The lone run was scored, as we remember, when Rafael Furcal lead off the top of the first with a triple followed by Skip Schumaker doubling to drive him in. From there it was just masterful pitching from both Halladay and Carpenter. Relive the highlights from Chris Carpenter via video here, and read on for thoughts — and those memorable photos — from the time. In six weeks of magical moments and inspiring wins, we now have one to head the list. For now, anyway, although it will be a challenge for any victory to top this. Last night was all the cliches — must win to continue, everything on the line — and the result could sound like a cliche too: Chris Carpenter pitched the game of his life. A complete game three-hit shutout, 110 pitches with no room for error because the Cardinals clung to a 1-0 lead — a lead that came on the second play of the game when Skip Schumaker doubled home Rafael Furcal after a lead-off triple. Carpenter got the job done. Not that it wasn’t intense. That’s A Historic Comeback Winner! The comeback climb is finished, and in the best way possible — the Cardinals are the Wild Card Champions! The details are so familiar now: on the morning of Aug. 25, the Cards were 10 1/2 games behind the Braves. They’d just been swept by the Dodgers — Aaron Miles’ revenge — and were 67-63. The the winning began, with that 8-4 Social Media Night victory over the Pirates. The winning continued. And now, history. Making the playoffs after trailing by 10 1/2 after 130 games is, according to Fox Sports Midwest, the biggest comeback in history. No. 2 on the list? The 2011 Tampa Bay Rays, who are the AL Wild Cards Champs following their own stunning win in Game 162. At one point they’d been 9 games back. Third on the list? The 1964 Cardinals, who trailed by 8 1/2 games before propelling themselves to the National League pennant. 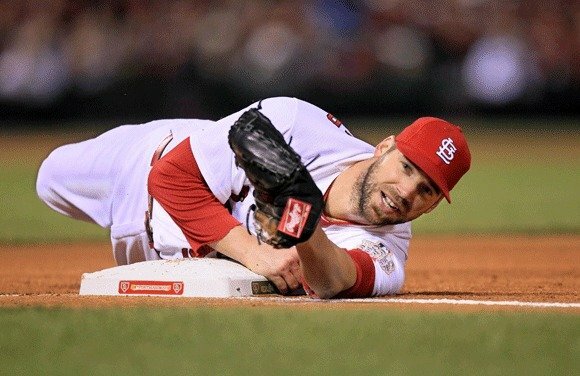 The Cardinals’ win was achieved without any of the tension or drama of Tuesday night. They took command from the very beginning, with five straight hits to open the game. Albert drove in the first run for RBI No.99, and the scoring continued until Nick Punto drove in run No. 5. 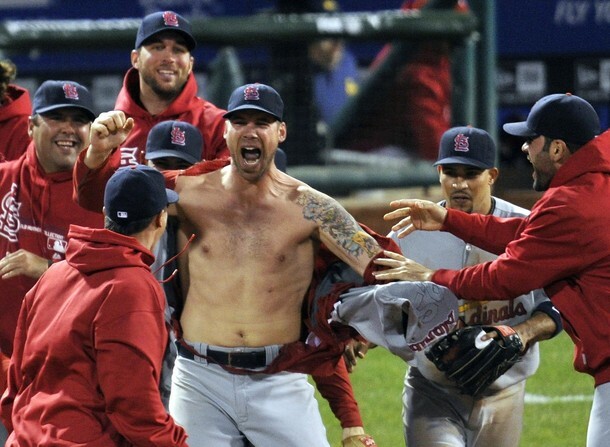 Chris Carpenter came to bat before even taking the pitchers mound — always a good sign. There was a boy in the stands, tousled jet-black hair, wide-open dark eyes, mouth open, scarcely believing he’s watching his hero pitching against the Washington Nationals one week ago today. One kid, watching another kid tease back and forth with the umpires, one kid watching the other kid’s big smile visible from the farthest reaches of Marlins Park, competing with that garish contraption beyond the outfield fence for electric wattage. The boy with his oversized jersey with his hero’s name across the back, the large 16 under it, cap that barely fits. Oh, how we envy that boy, look at him, all energy, squirming, hopping around in his seat, slapping the little glove he brought in case a foul ball comes his way, he’s ready. The boy, he’s pointing and shouting at his dad with every strikeout from his hero. That boy, he’s going to grow up watching one of the finest pitchers to take the mound in the history of the sport. He’s going to be able to tell his grand kids about the tall, strong Cuban who played this hard game with such infectious passion. Did you see what that boy saw? Twelve strikeouts in eight innings against a team a handful of days away from claiming a division title. That’s right, 12. His hero sliced through the Nationals lineup, and had FUN doing it. Did you see his hero in the top of the eighth, in a 1-0 game, with runners at first and third with two outs? Did you see his hero’s mom, on her feet, as the TV camera zoomed in, fanning herself in the excitement. That’s her nino, her hero who saved her in that oft-told story that’s reached the point of fable of the 15-year-old boy who saved her from hostile waters, saved her as they escaped for a better life in a country of dreams. Ah, September 2011 … how we miss you. And 2011 Cubs, how we miss you as well. The come-from-behind walk-off-wild-pitch win is one of those memorable moments from the magical September run of the 2011 Cardinals. 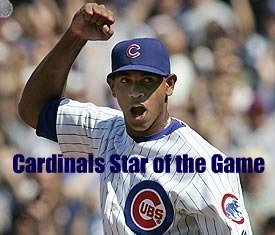 And, five years later, Carlos Marmol remains the Cardinals star of that game. 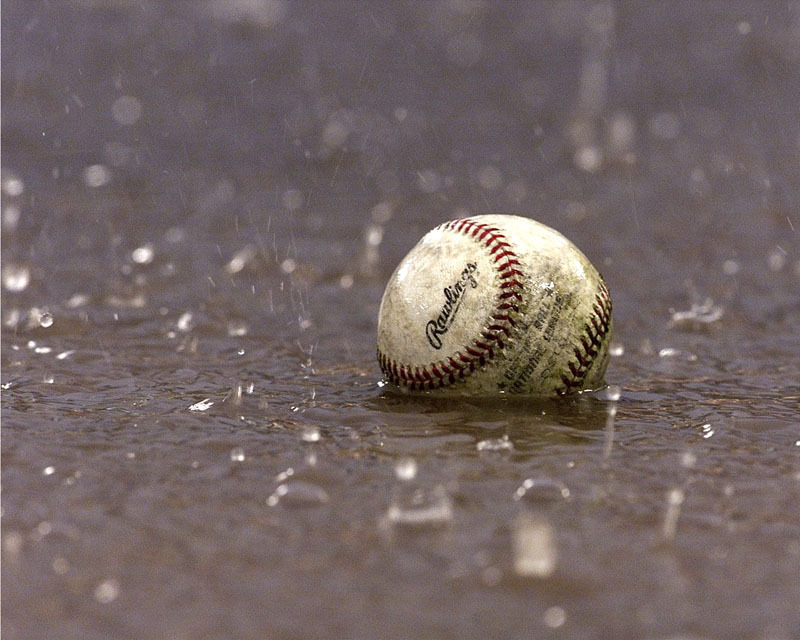 The bottom of the ninth inning in today’s game was every baseball cliche imaginable. It literally was a must-win, do-or-die game to keep alive the Cardinals hopes of catching the Braves in the wild card race. They honestly were down to their last strike — not once, not twice, but three times. And they did it. They won, 2-1 … in the most unconventional way imaginable. The game until that point was a frustration. The Cubs had scored their run in the first inning on three singles, half of the hits that Kyle Lohse allowed during his seven innings of work. He struck out eight, walked none and, at one point, retired 10 Cubs in a row. 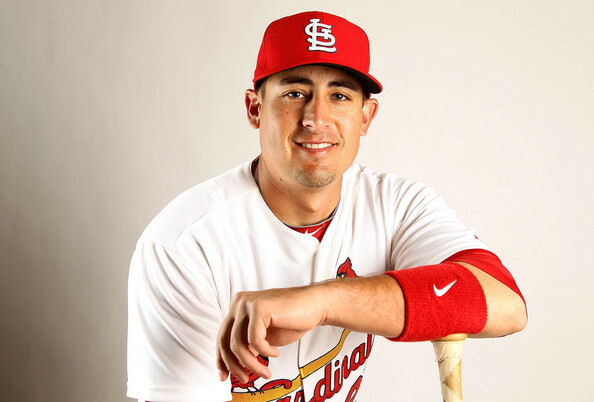 Meanwhile, the Cardinals only had four hits off Rodrigo Lopez through his six innings and had been retired in order by Andrew Cashner and Sean Marshall. The images of Sept. 11, 2001, are indelible — even 15 years after the fact. Yet so are the images of baseball’s return after that horrific day, particularly that of Jack Buck’s moving poem during the pre-game ceremony before the Cardinals played the Brewers on Sept. 17, 2001. Here’s a look at Jack’s poem.